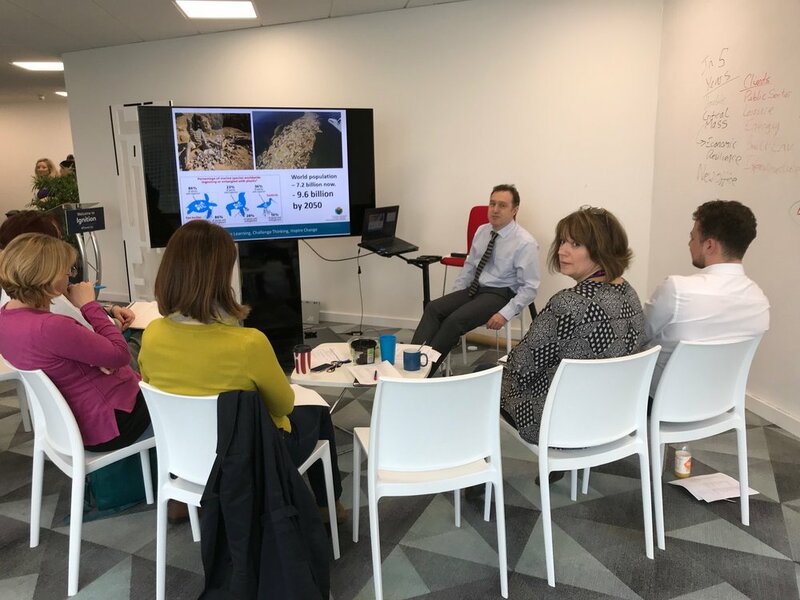 We were joined last week by Rhodri Thomas from Cynnal Cymru (Sustain Wales) who facilitated a workshop for the team to help us explore our environmental and corporate values. Rhodri began by asking the Team to choose several core values that we all individually associated with, before choosing those that we felt reflected Grasshopper Communications. Particular words came up time and time again: collaboration; professional excellence; respect; and environmentalism. As well as encouraging self-reflection – the session also helped build our knowledge of the Well-being of Future Generations Act (2015), along with the ideas behind ‘sustainable development’, and how this includes improving social, economic, environmental and cultural well-being. The notion of sustainable development is a fundamental aspect of what we are attempting to achieve at Grasshopper Communications. Specialising in the built environment, energy and the construction sectors, Grasshopper aims to be both socially and environmentally sustainable in how we work. This, again, is an example of us buying into the Well-being of Future Generations Act, a move in which we hope we will be followed by numerous other businesses throughout Wales. Grasshopper Communications is now a proud member of Cynnal Cymru and hopes to use its large network to develop our focus on sustainability, with the vision of becoming a frontrunner in the field of sustainable development in Wales. We have recently been involved in Keep Wales Tidy events, such as the Great Welsh Beach Clean at Aberavon and this is one of the many events that we will be getting involved with in the near future. To keep up with Grasshopper’s sustainable journey please follow us on Twitter @Grasshopper_UK or get in touch.